| News | A Tribute to Dana L. Haskin, Jr.
A Tribute to Dana L. Haskin, Jr.
Dana L. Haskin, Jr. – 86, passed away peacefully surrounded by his family on January 16, 2017 at the University of Vermont Medical Center in Burlington. He was born to the late Dana L. Haskin, Sr. and Edith (Bryant) Haskin on August 31, 1930 in Providence, RI. Dana was a 1949 graduate of Montpelier High School and then proudly pursued a military career culminating in 33 years of combined service as a Lt. Colonel in the United States Air Force and the Vermont Air National Guard. He served in the Korean War as a left gunner on the B29 and with the Vermont Air Guard F89J Flight Group A. 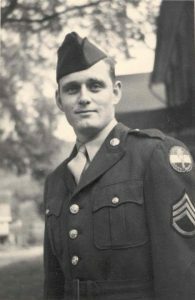 He received many medals and awards, notably the Air Force Commendation Medal and the Vermont National Guard Commendation Medal. On March 23, 1952, he married Eleanor Farr in Waitsfield, Vermont. First living in Texas as Dana continued his service, they later returned to Waitsfield to help Eleanor’s mother operate the Waitsfield-Fayston Telephone Company, as it was known then. Throughout the 1960’s and 70’s, Dana and Eleanor invested their time and energy to grow the company, investing in technology to bring state of the art telephone, cable TV and eventually Internet service to the Mad River Valley. In 1994, the company expanded its customer base to additional communities in the Champlain Valley and is now known as Waitsfield & Champlain Valley Telecom. Dana was immensely proud of the company and all who helped build it. Dana and Eleanor raised four children, two that continue to run the company today. Dana was an active community member serving as past-president of TANE (Telephone Association of New England), was one of the founding members of the Mad River Valley Ambulance Service, a member of the Waitsfield Volunteer Fire Department, and for many years taught Hunter Safety Education. He enjoyed the outdoors, hunting, fishing, collecting and researching firearms, time at ‘camp’, spending time with his family and many canine companions over the years. Dana was predeceased by his loving wife of 63 years, Eleanor G. Haskin on May 3, 2015, and daughter Susan Haskin Simms on July 14, 2003. Dana is survived by son Eric and his wife Anna of Waitsfield, son Gregg and his wife Roberta of Berlin, son Scott of Hinesburg, grandchildren, great-grandchildren, a sister Ann Haskin Ways of Glendale, CA and brother Father Jay Haskin of Stowe. Dana was also predeceased by his stepmother, Marguerite Haskin. Funeral services will be held at the Waitsfield United Church of Christ on Tuesday, January 24, 2017 at 11 a.m. with a reception to follow at Waitsfield Telecom in Waitsfield. Interment services with full military honors will be held in the Waitsfield Village Cemetery this spring. In lieu of flowers, memorial gifts would be appreciated to the Mad River Valley Ambulance Service, PO Box 305, Waitsfield, VT 05673. Assisting the family is the Perkins-Parker Funeral Home and Cremation Service in Waterbury. To send online condolences please visit www.perkinsparker.com or the funeral home Facebook page. A reception will follow the service at Waitsfield and Champlain Valley Telecom.